Mouth of the Dragon, Prophecy of the Evarun, is a novel by Thomas Barczak, published by Perseid Press, February 10th, 2017. Available as an Amazon pre-order on Kindle and shipping February 10. 2017. Subsequent releases will include trade paper and Nook. Thomas Barczak is an artist, architect, and a writer whose stories tell the tales he’s always dreamed about. His work also the illustrated epic fantasy novel, Veil of the Dragon, and the Kindle serial, Awakening Evarun (Parts I-VI), both set in the Evarun universe. He’s also written a comic fantasy serial for Kindle called Wolfbane (Parts 1-2 of 3). 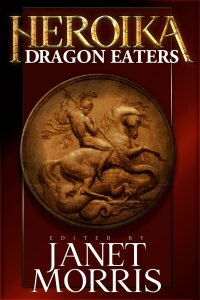 His short fiction includes contributions to Heroika 1 – Dragon Eaters, Nine Heroes, Terror by Gaslight, and What Scares the Boogeyman, as well as stories for two volumes Janet Morris’ award winning Heroes in Hell series, Dreamers in Hell, and Poets in Hell. Tom writes because he must. He writes because he needs to tell others the stories he has held so long inside, stories that inspire his paintings and his poetry — stories that have always been with him, even years ago when he’d sit at a table with friends, slaying dragons. 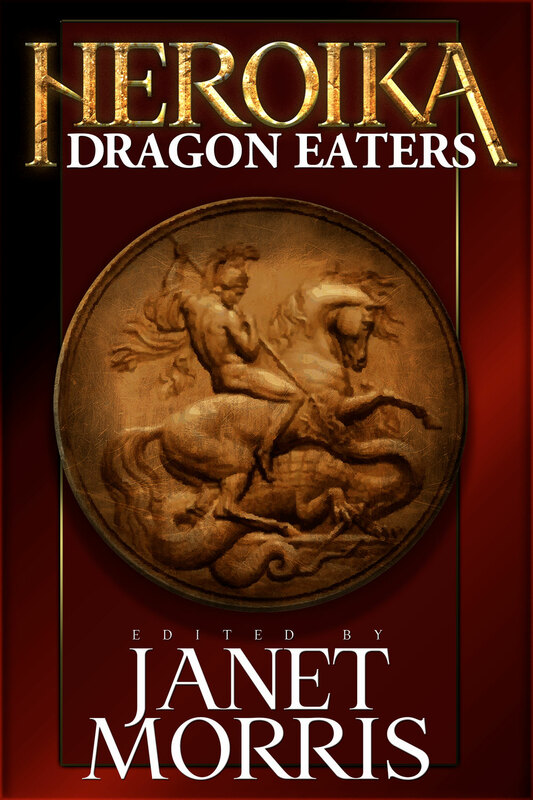 Posted by eranamage in A Week with the Dragon Eaters, Anthologies, Author interviews, Author Spotlight, Character Interviews, Dragons, Fantasy, Fantasy world., Heroes, Heroic Fantasy, Heroika, heroism, Historical, mythology, Support an Indie! Today I welcome William Hiles for Heroika Week. *Who are you? Captain Jackson Turner. Why are you embarking on this quest? Revenge. For the killing of my men. For the devastation wrought by the beast. Where are you from? (Tell us about it.) From Morgantown, Western Virginia. Though my family were farmers and shop keepers, I managed an appointment to West Point, where I was eventually commissioned as an officer in the United States Army. *Tell us about dragons in your world. One exists. I don’t know why. I don’t know how. All I care about is killing it. Do you have a family? I lost my family, a wife and child, to cholera many years ago. Do you see yourself as a hero? What is a hero? No. What is a hero? That’s for others to decide. For me, it’s a matter of duty. To your men (or family). To yourself. What is the technology level of your world? Mid-19th Century. How do you define a hero? Someone who does what needs to be done, no matter the risk, for the benefit of others. Someone who performs a selfless action. Ordinary people who proceed with grace under extraordinary circumstances. Why did you choose this world/era to write in? I’m a history nut. I love the challenges of bringing the past to life. I have a very special connection to military history, especially that of the United States. Give us a couple of lines about your characters. Brave men who take a stand against an unimaginable horror, far beyond that of ordinary war. Former enemies, forced together for survival, who become brothers in a soul-searing crucible. Heroika: The Dragon Eaters is a dark heroic fantasy – how do you define that genre? Dark heroic fantasy, to me, is a story of ordinary people, faced by extraordinary challenges, in a landscape that seemingly offers only obstacles or heartache. And yet despite this, these people rise to the challenges, overcome the obstacles, and ultimately succeed in bringing hope or peace or some fitting resolution to the story—even at the cost of their own lives. How much research did you need for your story? Not much actually, having been a student of the era for many years. Are you a plotter or a pantser? Mostly pantser. How a story ends is usually what I need to know before I begin, everything else is a journey to that end. What other novels/short stories have you written? Early in my career I had quite a few stories in small press magazines. However, most of my output in recent years has been articles relating to my work (video games). I’m now getting back to writing more fiction. Tell us one unusual fact about yourself. I’ve kept a list of books I’ve read since I was 12 years old. I have over 1600 books on the list. This can be a Dragon-Eater recipe, interesting info about the world in which your story takes place, historical info, or somesuch. Red Rain is set during and after a real American Civil War battle. The first land battle of the Civil War, in fact, fought in the vicinity of Philippi, Virginia (now West Virginia) on June 3. 1861. Writer Ambrose Bierce did serve in this battle. William Hiles, is a former magazine editor, game designer, writer and artist, living in Round Rock, Texas, with his wife, son, and a menagerie of pets. He likes to ramble on about history, cooking, art, and writing. Although he has been accused of living in the past, he does not write with a mere quill. It has to be an Australian Black Swan quill. Why are you embarking on this quest? To support my commander and friend, Roland (and because the emperor Charlemagne has commanded it). Where are you from? (Tell us about it) I hail from the land of the Danes, a place filled with mighty warriors, skilled craftsman and breathtaking fjords. I left my lands to seek out adventure and riches in foreign lands. *Tell us about dragons in your world Dragons are a very serious threat. The dragon Nidhhog lives beneath the world tree, Ygdrassil, constantly gnawing at the roots, while Jorgumander, the world serpent, lurks in the depths of the sea, waiting for Ragnarok, when it will be free to do battle with the gods. Dragons are powerful creatures covered in armour-like scales and wielding wickedly sharp claws and teeth. What is the best way to kill a dragon? If you kill the brain, you kill the beast. Of course, to do so, you must get past its claws, tail, teeth and flame and strike up close and personal. But what warrior doesn’t dream of facing such a challenge? It will be either a mighty victory or a glorious death. How do you define a hero? Someone who puts their life on the line for another. Being heroic is about seeing someone in trouble and trying to help them, regardless of danger, recognition or reward. Why did you choose this world/era to write in? The time of Charlemagne was full of warriors (Franks, Saxons, Danes, Norse, Saracens, etc), battles between religions, and a belief in dragons and the like was still prevalent amongst the populace. Give us a couple of lines about your characters. Roland is one of the greatest fighters of his time. He is both a talented fighter as well as an inspiring leader who commands the respect of friends and foes alike. Ogier the Dane is a massive warrior who serves Roland because he feels a kinship with him and admires his skills and leadership. But Ogier is a legend in his own rite. Statues of Ogier the Dane still grace the Danish landscape and it is said that when Denmark is in danger, Ogier will rise from his throne and draw his sword to protect the land. 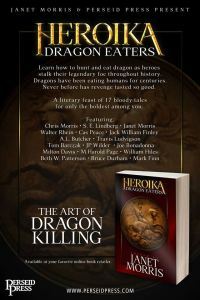 Heroika: The Dragon Eaters is a dark heroic fantasy – how do you define that genre? This is heroic fantasy without the shiny, decorative armour and maidens in silk waiting in the highest tower for rescue. It is filled with sweat and blood stained leather, battle notched blades, terrible creatures and true, raw emotion. What other novels/short stories have you written? Yare’ Darkness Bound and Iron Song are novels in the Nephilim Chronicles (I am currently working on the third book in the series). The first is urban/supernatural fantasy and the second is historical fantasy. Unrelenting is a dark, urban fantasy novella. What book(s) are you currently reading? I am currently reading The Bone Sword by Walter Rhein and The Lives of Tao by Wesley Chu. I also recently read Schade of Night by JP Wilder. Tell us one unusual fact about yourself. I broke my nose in a full contact Muay Thai championship (although I still won the fight with a third round TKO). The indestructible sword, Durendal, wielding by Roland, is one of the most famous swords in history; second only to King Arthur’s Excalibur. The eternal sword is said to be embedded in the stone wall of the Chapelle de Notre-Dame in Rocamadour, France, where it can be seen today. *Who are you? Seth (S.E.) Lindberg. I live near Cincinnati, Ohio working as a microscopist, employing my skills as a scientist & artist to understand the manufacturing of products analogous to medieval paints. Two decades of practicing chemistry, combined with a passion for the Sword and Sorcery genre, spurred me to write graphic adventure fictionalizing the alchemical humors: Dyscrasia Fiction. I co-moderate a Goodreads- Sword & Sorcery Group and invite you to participate. *Tell us about dragons in your world; and please share some lore/myths from it. There is just one dragon in the Legacy of the Great Dragon. Therein, the Father of Alchemy entombs his source of magic, the Great Dragon. Many think of medieval chemists and occult witchcraft of the 1500’s as being the origin of alchemy. Indeed there was a popularization ~1500 with the teachings of Heinrich Cornelius Agrippa. Peeling back the onion of myths and history, we learn that alchemists professed knowledge having come through the Greek god Hermes; hence the lore of alchemy is often referred to the Hermetic Tradition. One of the earliest known hermetic scripts is the Divine Pymander of Hermes Mercurius Trismegistus. Within that, a tale is told of Hermes being confronted with a vision of the otherworldly entity called Pymander, who takes the shape of a “Great Dragon” to reveal divine secrets. Digging into history more, one learns that Hermes is a reboot of the Egyptian deity Thoth (who was called by Greeks as Hermes Trismegistus). According to Greek and Egyptian myth, Thoth was able to see into the world of the dead and pass his learnings to the living. The other most known script of the Hermetic Tradition is the Emerald Tablet’s engravings; the original stone has long since been lost, but translations and recordings have persisted over centuries. Even Sir Isaac Newton was fascinated with the Tablet and made his own translation readily available (presented below answers). Legacy of the Great Dragon fictionalizes the Hermetic Tradition, presenting the “Divine Pymander–Great Dragon” as being the sun-eating Apep serpent of Egyptian antiquity (a dragon who ate the sun each day from under the horizon, in the underworld). How do you define a hero? Heroes take many forms; “good “ones seek to help humanity even at the expense of their own lives, property, or family. If there is a hero in Legacy of the Great Dragon it is Thoth who strives to maintain learning while seeking the divine. He is posited as a non-violent hero/protagonist. His antagonists include Horus and Set who wish to use alchemy in war. ‘Tis true without lying, certain & most true. From this are & do come admirable adaptations whereof the means is here in this.